NYISO pegged New York as one of top five states for distributed energy, but added that considerable potential exists for more. Small-scale combined heat & power accounts for the greatest amount of distributed generation installed in the state — 57 percent. 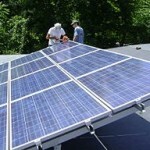 Solar PV ranks second at 41 percent. Energy storage accounts for the remaining two percent, according to the annual report. As more distributed energy is installed, it may be aggregated to serve the grid in new ways, providing price responsive load, capacity and ancillary services. This will create a need for better metering and communications infrastructure, the report said. NYISO also pointed out that the increased distributed energy is likely to modify the state’s load profile. As a result, the grid operator says it may need to adjust how it does real-time and long-range load forecasting to account for behind-the-meter data currently hidden from its view. The full NYISO report is here. A ramp up of solar and storage on the California grid could dampen wholesale prices, according to a new white paper by Black & Veatch and the Solar Electric Power Association. “Impact of High Solar and Energy Storage Levels on Wholesale Power Markets” considers the influence on the California grid of significant solar plus storage in 2030. It comes as the state debates increasing its renewable portfolio standard from its current 33 percent by 2020 to 50 percent by 2030. The analysis finds that increasing renewables and storage creates “clear reductions in both weighted-average locational marginal pricing as well as in the on-peak to off-peak spread” compared to using natural gas to meet future energy demand. A renewable strategy could be $1/MWh cheaper than a natural gas strategy if the state stays with the 33 percent RPS and 1,325 MW of energy storage. Even greater savings could be achieved — up to $5.28/MWh — in scenarios that increase the renewables mandate. “It is clear that increased solar and other renewable energy on the California grid will have significant benefits in terms of reducing wholesale market clearing prices, reducing imports and reducing power sector carbon emissions. While the increase in solar will require more fast ramping capacity and create more curtailments, energy storage can readily address both issues,” the report said. Global telecommunications network providers are ramping up their spending on distributed generation and energy storage, according to a new Navigant Research study. “Wireless providers — and subscribers — today have little tolerance for power outages that interrupt service,” said the report. Navigant Research forecasts that telecom will ramp up distributed generation and energy storage purchases from $2.4 billion in 2015 to $3.4 billion in 2024. “As the telecommunications network has grown, increased its density, and expanded to the edges of the globe, it has also become a major consumer of power—almost all of which is in the form of electricity,” said Navigant in a report summary. By producing their power onsite, telecom companies can often avoid high retail electricity rates and insulate their operations from grid outages, Navigant said. Avista Utilities is now the site of the largest capacity flow battery in North America and Europe, according to UniEnergy Technologies (UET). UET’s 1 MW energy storage system, which has a maximum energy capacity of 4 MWh, was installed in Pullman, Wash.
Avista Utilities will use the battery for load shifting, frequency regulation, and conservation voltage regulation on the Turner distribution circuit. The battery also will provide services for Avista customer Schweitzer Engineering Laboratories. The project is funded in part by the Washington State Clean Energy Fund. The engineering school in Bangalore, India, installed a 30 kW, 120 kilowatt hour (kWh) vanadium flow battery at the school’s SunEdison-GAT solar research and testing center. The long-duration battery (four hours at nominal power) will reduce the need for GAT College to run diesel-fueled generators when there are power outages at night. The ESP30 battery is distinguished by its ability to operate in extreme temperatures, ranging from -4 degrees to 131 degrees Fahrenheit, according to Imergy. The battery will store energy generated by a SunEdison 50-kW PV system. SunEdison collaborated with the college to create a research and development facility, which is studying solar water pumps, storage solutions, hybrid systems, solar power plant monitoring and mounting structures. 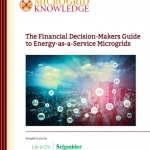 Track the latest in microgrid news by subscribing to the MicrogridKnowledge.com newsletter. It’s free.